The Internet is an international, multilingual place, and although English is the lingua franca of international business and communication, it’s still important to make it easy for people who don’t speak English to stay in touch with you. This is especially true on Facebook, where posts can travel between countries very quickly, and people who speak a wide variety of languages can see them in a matter of seconds. A very strange translation. A better one would be “This is (truly) how you trust your love” (which still sounds weird, but communicates the idea more accurately). After seeing this, you should be worried about letting Facebook do the translating on your posts. Fortunately, you can now include your own translations of post on your Pages, giving you greater control over how your post is received. Why Post in Multiple Languages? There are a lot of people who will find this new option very useful. The first and most obvious use case for multilingual Facebook posts is multi-national corporations who have customers and partners all over the world—the kinds of companies that know that they have first-language speakers of many languages seeing their posts every day. Instead of relying on Facebook to translate or worse, not translating at all, these companies can now just include multiple languages in the same post. Many international companies also run a large number of different Facebook pages that communicate in different languages—this could potentially help those companies consolidate at least some of their Facebook properties, making management of their social media marketing Your Guide To Social Media Marketing Your Guide To Social Media Marketing Right now, there is an onslaught of both people and companies turning to social media outlets. The competition is fierce, and no company can waste time or money doing it wrong. Read More campaigns that much simpler. But it’s not just these massive multi-nationals that will benefit. Even smaller companies in countries that have a number of first languages—Switzerland, Belgium, and Canada come to mind—could better serve their clients by posting in multiple languages. Accurate and effective communication Improve Your Communication Skills with These 7 Websites Improve Your Communication Skills with These 7 Websites Good communication is a subtle force that will open doors professionally. These seven online resources will help you become better at this all-important soft skill. Read More is crucial in establishing a successful Facebook presence, and not having to worry about weird Facebook translations will help a lot of companies around the world. There are some really popular Facebook pages 35 Most Popular Facebook Pages in the Geek World 35 Most Popular Facebook Pages in the Geek World The world's largest social network is also a way to find out what's happening around the world, get a dose of daily entertainment, and even learn a thing or two. Read More out there that aren’t run by multinational companies, too, and many of these pages could benefit from this feature. Hobbyist communities could be better served by Facebook pages with multilingual posts, for example. Individuals, too, can take advantage of this new possibility: expatriates living in countries that speak a language other than their first will be able to better communicate with all of their contacts, no matter which language they speak. Unfortunately, multilingual posts are only available from Facebook Pages at the moment, so you won’t be able to use them in your personal posts, but that possibility may be coming in the near future. 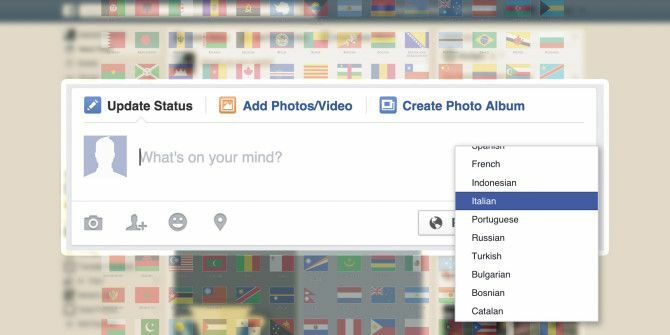 To get started posting to Facebook in multiple languages, you’ll need to enable multilingual posts in your Page settings. Hit Settings in the top-right corner of your Page, and you’ll see a long list of different options in General tab (you’ll only see these options if you have admin privileges on your Page; editor privileges won’t let you change this setting). Scroll down until you see Post in Multiple Languages. Hit Edit, check the box, and click Save Changes. That’s all there is to it! Now that you’ve enabled multilingual posting in the settings, you’ll see a new option in the text box where you type your updates; once you click Write something…, another option will appear. Click Write post in another language, and you’ll see another text box below the first one where you can select and enter the post in a second language. Want to add a third language? Click Write post in another language again. You can do this for a large number of languages (I haven’t been able to find a limit; it’s possible that there isn’t one). Now, when someone sees your post, they’ll be given the option to select a dropdown menu and view the post in any language that you’ve made available. The option to post a single update in multiple languages will help a lot of companies and individuals around the world simplify their social media process as well as make it more effective. The more people you can communicate with, the better! And using someone’s first language is sure to earn you some appreciation. Of course, you’ll have to make sure that you’re using good translations—don’t rely on an online translation service (even Google Translate Forget Google Translate: 3 Ways to Get an Accurate, Quick Translation Forget Google Translate: 3 Ways to Get an Accurate, Quick Translation Whether you're planning to apply for a job or an apartment abroad, or are looking to translate your web page, you need to get things right even with a foreign language. Read More ). It’s really obvious when you do, and the translations are often terrible. Make sure a native or near-native speaker is helping you out with your translations to make sure you benefit from this feature, or find a freelance translator to do it for you (these sites for freelance writers and coders 5 Websites Where Freelance Writers & Coders Can Find Work 5 Websites Where Freelance Writers & Coders Can Find Work Freelancing has its benefits, but the difficulty comes in finding people and companies to whom you can market yourself. Fortunately, there are now more places to find freelancing gigs than ever before. Read More will work just fine). Will you use multilingual posts on your Facebook page? Would you find them useful on your personal page? Can you think of any other good uses of this feature? Share your thoughts below! Explore more about: Facebook, Translation. 9 Thriving Twitter Communities All Geeks Should JoinDid You Know You Can Play Chess Inside Facebook Messenger? "Amo" is master, "Amor" is Love, so nothing wrong with the translation there. Thank you for the post, good information ! This is a really great post, thanks a lot for it. I think your best bet is to create multiple videos, one for each language. You could also potentially subtitle the videos in other languages, but I'm not sure how difficult that would be or how to go about doing it. Yeah, I suppose you wouldn't be able to do that for live videos. If you find a way to successfully manage multiple languages, I'd love to hear about it! I love this option for our pages. But we haven't found this yet on the mobile app yet or on m.facebook.com, either. Any ideas? Thanks! As far as I'm aware, it isn't available except for through a desktop browser. Hopefully it'll be coming soon! I was editor (and now Admin) of a FB page where we use EN, DE et IT languages' posts. Sorry, I'm not sure why that's happening. As far as I'm aware, you can't edit a post to be in multiple languages, but I think Facebook has changed how this feature works since I last checked it out, so things could be different now. I manage a FB page for a latin crossover music group. I have just started using this new feature to post in English, Spanish and French. I wasn't sure how it would react, so I asked a friend who has FB set to Spanish to check the post and see if it automatically shows up in Spanish. When he looked at the post, he said it was in French (default should be English) and that there was no drop down to change the language. Any ideas why it showed up in French? In your experience, will a post always show up in the original language it was written in? Or, if the person posting chose to include your native language, will it automatically recognize that and show the translated post? From your explanation above, it sounds like everyone who views the post should see it in the original language it was posted in and use the dropdown to choose a translation. Is that right? Is there a way to have it automatically detect someone's FB is set to Spanish and show the Spanish translation without having to change it? Hm . . . I'm not sure why that's happening. I haven't used it much myself, and none of the pages I follow use it (at least that I've noticed), so I'm afraid I can't offer a whole lot of help here. I think Facebook has changed how the feature works since I wrote the article, too, so things could be different. If you go into your page settings, is there a way to select the default language? Dann, this was super helpful! No blog explains it like you :D thanks a lot! Do you know how Global Pages work? 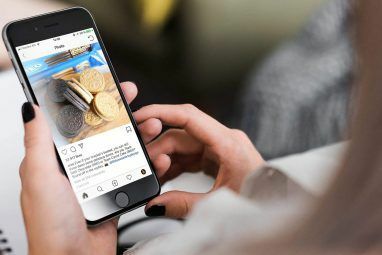 My business is entering different markets, so I read you can have like a main Fanpage and set up another one for a different market in order to differentiate the content of each one (based on the market needs and conversation going on around the brand). Is this possible? Do you know how to start it? I think you need to develop both pages and after that link them somehow, but I can't find how it works anywhere. Sorry, I don't know anything about that! I'll look into it, though; maybe it's worth writing an article about. how can I add another language that's not on the list? As far as I'm aware, you can't . . . you'll just have to wait for Facebook to add it. Hopefully they'll be adding to the list soon! Hi, I was just wondering how does the translation work for existing posts? I have some posts that I added from the beginning in two languages and some in only one language. For those that are already translated I have the option to add another language, but for the ones in only one language I don't have this option. Is there a restriction? Do you need to translate them from the first time you post them on the page? I imagine that you need to have posted them in multiple languages the first time. Hi Dan, thank you for your post, it’s very interesting! Last week we tried this new feature with the publications of this week (via Facebook schedule). Our page have followers from 12 different countries and since two months ago we do the segmentation of the public in 3 languages with their respective countries (in all of our publications). For example: English for UK, US, Ireland and Australia, Italian for Italy, etc. We have seen that the interaction with the publications has plummeted this week, do you think that it may be linked? Maybe this option is not available in mobile and this is the reason? We have contacted Facebook and the Assistant told us that she did not know ’cause “this feature is too new”. She advises us to create a page for each country and then ask Facebook to create a global page. But we want to continue publishing the same posts in all countries and it seems impractical. I'm glad you liked the post! Unfortunately, I don't know why your engagement would have dropped off so suddenly. If you tell me what your page is, I can check it out on mobile and see what it looks like—that seems like a good theory. Pretty frustrating that Facebook can't help you! You'd think they'd know their products well enough, even if they're really new. If you find out anything new about this, please keep us updated! I'm not exactly sure what the different is . . . do Global Pages have similar functionality, do you know? I would imagine that it's a bit different, but if you have audiences all over the world, they could compliment each other pretty well. Ah, that's good to know. I don't know any way to edit things like that, so you might be out of luck. It's still sort of in a testing phase, though, so it could show up as they continue working on the feature. Do you know if links that you post will show up in the corresponding language? Meaning if my links are different depending on the language (different versions of a site) will the preview be different or the same? Hm, I don't know the answer to that. I'd say that it's unlikely, though; if you want to post URLs in different languages, you'll probably need to create different posts. Though it's possible that there's a way to get that to work. I have asked via Facebook community help why they do not allow one main link per translation of a post, I'm waiting for their answers. It's a pitty Dann does not have much experience with this feature, as far as I'm concerned I would try to avoid it. For example I do not understand how facebook decides on the language of follower. Since I did not trust the translation of a post I posted separate messages one at a time but with language restrictions each post was for a different language. I got a like from the same person for the messages in two different languages, so apparently one person can be perceived by facebook as knowing more than one language... even though I thought that they would use the language in the profile of each follower. If someone found an easier way to handle multilinguagl posts , even with multiple pages, I'm interested. I'll start reading about a the global page... I was not aware that such a concept exist. Thanks for sharing your experience on this one. I think the feature is probably still under development, which is why we're seeing some posts not acting quite the way you'd like them to. Also, I think language is determined by a setting; users can change their primary language to whatever they want, I believe. I understand that language is a setting, but one user can have only one language at a time, this is why I'm puzzled to why one user could like two of my posts in different languages that were published at the same time. Another huge disadvantage, is that if you start translating your posts you are forced to choose English let's say for your default language, and you might translate it in 2-3 other languages, but then you won't target (or at least theoretically) all the other users using other languages that might have liked your page (e.g. Turkish). The feature would be great but it does not work properly. I created a post in English and German with our company page and boosted it. But also people with FB set to German on their devices received it in English. And one colleague who set FB to French, received it in German... I mean, I expect that the language variant will be displayed depending on the users FB language settings on the respecitve device. But this does obviously not work. Other experioences like this? Hm . . . that's strange. It's possible that it's always sent out in the default language of the post. But that wouldn't explain the results you saw. Have you tried it since then? Does it work on mobile? or in the Page Manager app? As far as I can tell, it only works on the full desktop site. "Confiar en tu amo" means "to trust in your master". "Confiar en tu amor" is "to trust your love". I know! That's really unfortunate; I'm hoping that they'll expand this to personal accounts in the near future. It's super useful, and I don't see a downside to them doing that, so I have high hopes.